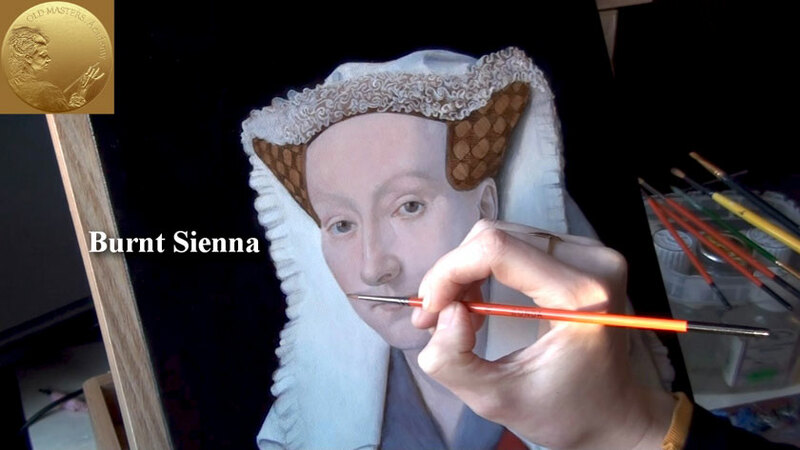 Now we keep on painting the face applying a semi-transparent layer with the flesh color. The semi-transparency is achieved with the help of the opaque paint diluted by Liquin Original. This mix is easy –to manage and can be quite opaque or transparent depending upon the thickness of the layer. Whilst thinning the layer, we use, once again, a thicker layer of the orange-pink mix in its light- and mid-tones. The paint has to be spread towards the darker areas. As the dead colors underneath the flesh color are lighter then required, we get a little darker, pink-orange, color. Thus we manage to mix optically the somber and warm colors on the canvas. In the shadows this color looks differently. This is the result of the difference of the dead colors in the bottom layer. Depending upon the results required we vary the thickness of the layers from thicker in the light areas to thinner in the darker ones. To the mix that we made for the warm flesh tone we add some more white. Thus we’ll get it much lighter. The light skin color is used for highlights. The highlights of the face are darker than the white hood around the face. We constantly compare the tones with each other. The whole face, the highlights included, is darker than the lightest white of the picture. A thin round brush is ideal for the purpose. The paint mix has very little medium if any. Of course it depends on the amount of oil in the paint, taken from the tube. Highlights are necessary to portray Margareta’s face in the three-dimensional way. At the same time we have to control the area covered with highlights. It shouldn’t be too large or too small. Margareta’s ear is in the dark place of the portrait. However, there are light areas on it that have to be made to give a shape to the ear. The lightest spots on the ear are darker than the lightest highlights on the face. When the previous layer is dry, we can proceed to transparent glazing on Margareta’s cheeks. The blend of Titanium White with Burnt Sienna is mixed with Liquine Original. With the help of a small round brush (however you can use a small flat one) we thinly apply this paint mix, So that to deepen the tone of the flesh color. Glazing is applied in such a way so that no borders were visible in the places they start or end. It’s quite critical for this glazing to be transparent, so the lower layers of the color are still visible under the top layer. Thus they optically mix in a deeper tone of the warm flesh color. For the extra smoothness of glazing layer you can use one more brush. A dry one, with long soft hair. Such a brush will be ideal for spreading the paint without any visible marks or lines. The optical mix of the blue-cold dead layer with warm transparent layers of glazing results in making the tone and color of the skin more natural. We have to mention that such a combination of colors is impossible to achieve in any other way. Even mechanically, you won’t get it on your palette by mixing blue with pink. So the shadows on Margareta’s face, resulted in the previous layers of the underpainting, and the dead colors are getting comparatively lighter. It’s high time to deepen the shadows. And once again we use glazing. The glazing paint is darker in comparison to that used previously. 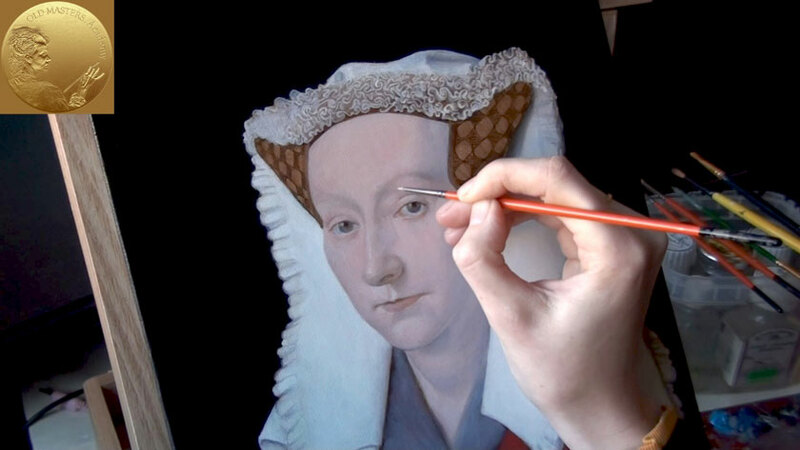 The Transparent layer is applied with the help of a soft brush in exactly the same way as before. The more glazing layers are applied over each other the darker the skin tone becomes. This is a time-consuming technique. The Old masters were real professionals in glazing. And it is difficult to say how long it took to complete the original painting. Here, we apply various techniques, including semi-transparent warm colors, opaque highlights and transparent glazing. 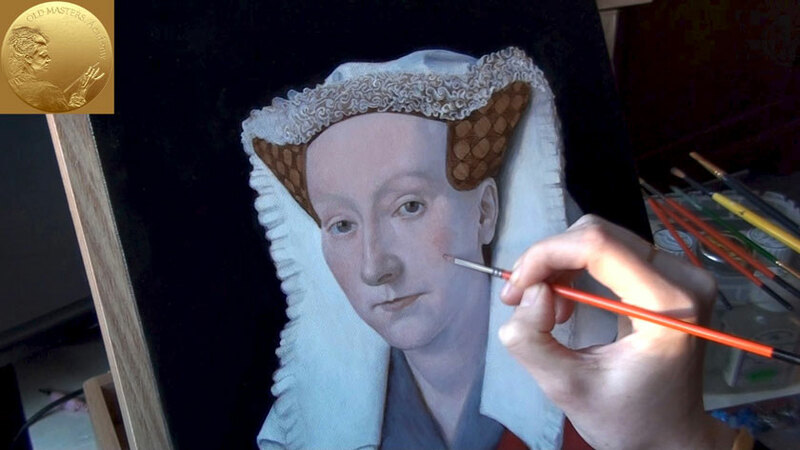 The artist can control the process of painting, especially when the layers of paint are so thin and may easily change the appearance of the picture. The stages of such old techniques can be easily followed. However, it does require a certain degree of discipline. For example, you have to wait the previous layers dry up, only then you may proceed to glazing. This is the end result of the old masters’ technique of multi-layer painting. 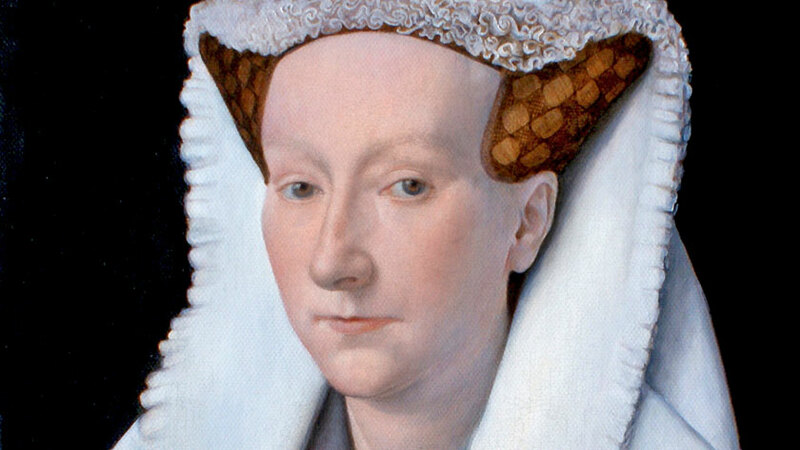 The original portrait of Margareta was created by Van Eyck in a very similar manner. Let’s revise the stages of the painting once again. First, we prepared the under-painting in brown. Second – we made the dead color portrait over the under-painting. Third – we got the warm flesh colors of the portrait with the help of both: the semi-transparent and the transparent glazing layers over the dead colors. The final strokes such as the highlights and deeper shadows were applied where necessary. The combination of cold and warm colors seen under the transparent glazing layers gave the effect of natural and smooth skin, which is so typical of the old school.